Here we are. 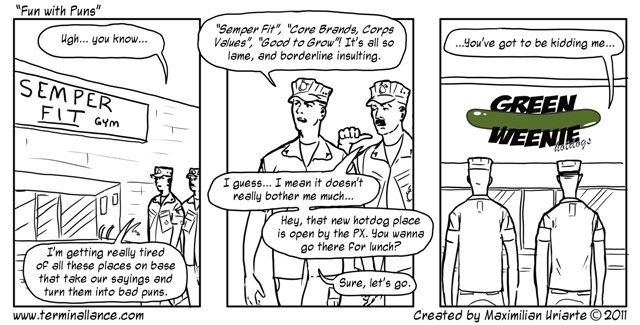 It’s Wednesday, and we’ve yet to post another “Terminal Lance” strip from the Marine Corps Times archive. It was only a matter of time, I suppose, before we dropped the ball on “Terminal Lance” Tuesdays. My apologies; we’ll do better. So without further delay, here’s “Fun with Puns,” which first appeared in print in the Marine Corps Times dated July 4, 2011. Enjoy! *He has a drill instructor ribbon with “V” device. * He led a PT run to Japan … when he was stationed in California. You can click on the image above to read them all. Feel free to share the link, too. We’re all friends here. So my question to you, readers, is this: Among Marines, why do lance corporals seem to have the best sense of humor? You think Lance Corporals have the best sense of humor? Ba-ha-ha! You should hear what MGySgt’s laugh about. Hahaha. We’re all ears, Master Guns. You have to have a good sense of humor when you get the shaft every day.